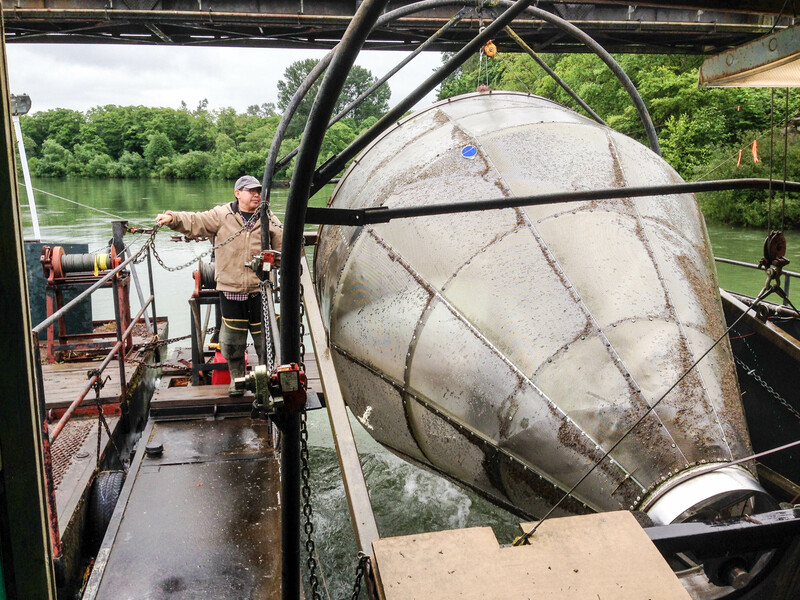 As the massive steel funnel rotated round and round in the Skagit River, scientific technician Dean Toba walked over to a control panel and pressed a button. The big apparatus, known as a screw trap, began to rise out of the flowing water. The spinning slowed to a stop. Toba, who operates this fish trap for the Washington Department of Fish and Wildlife, stepped over to the narrow end of the funnel and peered down into a metal box where dozens of tiny fish were swimming about. A few coho salmon and cutthroat trout were there, but the vast majority were young Chinook, about three inches long. Having survived the first critical phase of their lives, these fish would be counted and measured before heading back down the river. Many dangers still lie ahead. “It seems like the fish are smaller this year,” commented Toba, explaining that cooler water in the Skagit during the spring probably limited their growth. That could be a factor in their survival, as smaller fish are more vulnerable to predators. Are overall environmental conditions getting better or worse? That is, are we humans restoring salmon habitat in Puget Sound faster than we are degrading it through development and other landscape alterations? The question becomes tangled in a multi-layered endeavor to measure all sorts of ecosystem changes — positive and negative — while calculating the effects on salmon and other species. A further complication is that the greatest ecological benefits of a restoration project may be delayed by months, years or even decades. Despite the problems in measuring progress, the question of which way things are going at the moment is important, says Elizabeth Babcock of the National Oceanic and Atmospheric Administration. Her agency, NOAA Fisheries, is responsible for carrying out salmon-recovery efforts mandated by the Endangered Species Act. The law requires habitat assessments for listed species, and Babcock would like to know whether conditions are improving or declining on a broad scale. She hopes that researchers can untangle the question and provide some answers during the next five-year status review for Chinook. One might think that the easiest way to tell whether ecosystem restoration is making progress is to count the salmon coming back to spawn. More salmon would seem to indicate that something is going right; fewer salmon might signal problems. Yet there is a huge variation in salmon runs from one year to the next, making this indicator less reliable. Scientists say salmon survival is tied to a host of complex ecological factors. Much of the uncertainty around survival comes about after salmon leave the streams as juveniles. 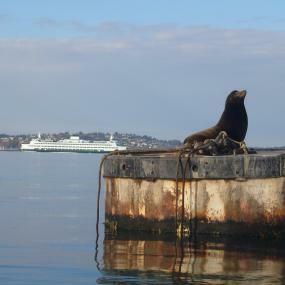 It is not easy to measure the number of predators, the amount of food or other factors that can spell doom in the open waters of Puget Sound and the Pacific Ocean. Often, these factors are simply lumped together as “ocean conditions” and judged as favorable or unfavorable after the salmon return home to spawn. Nagging questions about what is killing salmon and steelhead after they leave the streams, for example, is the driving force behind the Salish Sea Marine Survival Project, a combined quest of U.S. and Canadian researchers who are studying the physical, chemical and biological factors affecting fish populations in marine waters. A more direct way to measure the improvement or decline of freshwater habitat is to count the young fish, called smolts, as they head out into Puget Sound, said Joe Anderson, a research scientist with Washington Department of Fish and Wildlife. That’s when numerous fish traps — like the one on the Skagit River — become important. A stream’s annual productivity can be represented as the ratio of how many smolts survive for each female that lays her eggs. The Skagit River, which originates in the North Cascades and flows through extensive farmlands in the Skagit Valley, is the largest river in Puget Sound and one of the most productive. Since 1993, when the screw trap was installed on the Skagit, the annual productivity has averaged 293 juvenile migrants per spawning adult. Of the Chinook traps operated by the state, only the Cedar River, which flows through Renton, has higher average productivity with 353 juveniles per spawner. Others are Bear Creek near Redmond, 124; Dungeness near Sequim, 114; Green near Auburn, 102; and Nisqually east of Olympia, 71. When judging habitat conditions, these average productivity numbers can be misleading, considering that freshwater productivity — like marine survival — swings wildly from year to year. For example, an estimated 195 juveniles per spawner were seen on the Skagit River in 2009, followed by 392 in 2010, 715 in 2011, and 340 in 2012. Often, higher productivity numbers in one stream are seen at the same time in other streams, suggesting that weather conditions such as temperature and rainfall patterns play a major role in how many young salmon survive from egg to smolt. The funnel-like screw trap, which rotates from the force of the flowing water, is especially effective at capturing young fish as they migrate down the river. Baffles on the inside of the cone direct fish toward the narrow end, where they are collected in a metal box. On a large river, fish traps are designed to capture only a portion of the salmon run rather than all the fish moving downstream. To calculate the total migration, some of the captured fish are marked with dye and returned upstream. The percentage of released fish that are later recaptured gives biologists a basis for estimating the entire run from a limited sample. Rushing waters during a flood, for example, are known to destroy salmon eggs incubating in the gravel. Where rivers contain functioning floodplains or multiple channels to contain the flow, the water flows more slowly, and more eggs survive. Many of the ongoing restoration projects in freshwater are designed to increase channel complexity to give salmon eggs and fry a fighting chance. Success would increase productivity, although that is not always easy to detect. “We are measuring populations at the watershed scale,” Anderson said. “Fish coming out of 150 miles of stream will be entering the trap. It would be hard to attribute change to any one project. That does not mean that small restoration projects fail to increase productivity. It just means that long-term efforts must be sustained. Some studies suggest that it would take a 75 to 90 percent improvement in a river’s total freshwater habitat to reliably measure a change in the fish population. One ongoing experiment is designed to relate habitat restoration to increases in smolt production. Several watershed regions in Washington state are part of an Intensively Monitored Watersheds project, a partnership of federal, state and tribal agencies. In Hood Canal, where the focus is on coho salmon, three small streams are undergoing habitat enhancement, while a fourth stream is left alone for comparison — the “control” stream. After more than a decade, it appears that smolt production in Hood Canal’s Little Anderson Creek has increased when compared to Stavis Creek, the control stream. Researchers trapping coho observed a notable increase after a new million-dollar bridge replaced an undersized culvert in 2002, Anderson said. Ongoing research will evaluate whether smolt abundance further increased following the addition of man-made logjams in 2009 and 2016. It would be encouraging to demonstrate a direct relationship between habitat restoration and a boost in the salmon population, Anderson said. Little Anderson Creek is one small stream with a small salmon population similar to dozens of small streams in the region. As more data is collected, Anderson said he hopes to observe more measurable changes, not only in the Hood Canal streams but in other watersheds as well. Instead of measuring progress by trying to discern changes in salmon populations, biologists are now taking a direct look at the freshwater habitat conditions. The idea is to see which conditions meet the needs of salmon and whether those conditions are improving or declining throughout Puget Sound. Among the needs of salmon are cool, clean water; clean gravel for laying eggs; adequate, but not excessive, streamflows; and abundant food supplies. Salmon also need space to move and hide from predators and a safe estuary for transitioning into saltwater. Biologists stress the need to consider the structure of stream-channels — such as side channels, floodplains and associated wetlands — because the physical condition of the freshwater system influences all the other needs of salmon. Cool, clean water: At every stage of their lives, salmon need cool water containing oxygen. Cool water may come from melting snow or underground springs. Shade from trees helps to maintain cooler temperatures. Water rushing around logs or rocks and through shallow riffles replenishes the oxygen supply. Stormwater — often influenced by human development — can deliver excess sediment, which can smother salmon eggs in the gravel, as well as toxic chemicals, which can disrupt a salmon’s neurological, metabolic and reproductive systems. Clean gravel: Spawning salmon need gravel for laying their eggs. During incubation, spaces between the gravel are important to maintain oxygen levels for the eggs. Silt from runoff can fill in the spaces and cut off oxygen to the developing eggs. Fallen trees and other large wood in the stream help to create pools and riffles with clean gravel, as well as places for young salmon to hide from predators. Safe streamflows: When salmon eggs are incubating, they can be washed out of the gravel or crushed by churning rocks when a stream is running fast. After young fish leave the gravel, high flows can flush them downstream into unsafe areas. On the other hand, low flows can force young salmon into smaller areas, increasing competition for food and safe spaces and heightening the risk of disease. Good stream habitat includes a complex channel with pools and smaller channels that offer refuge during storms. Nearby wetlands may absorb surface flows during storms and then help maintain streamflows during dry periods. Uncontrolled stormwater from development exacerbates the problems by increasing flows during heavy rains but providing little or no water during dry periods. Food: After emerging from the gravel, tiny salmon fry thrive on insect larvae that live in the stream. As salmon grow, they consume larger larvae, adult insects and other organisms living in the stream. Also important are insects that fall from nearby trees. Like salmon themselves, the organisms they eat largely depend on cool, clean, oxygenated water Leaves falling from nearby trees help form the base of a healthy food web in the stream. Silt and pollution from stormwater runoff can decrease the diversity of “bugs” in the stream and limit the food supply for young salmon. Space to move and hide: The amount of space needed by young salmon depends on streamflow, the structure of the stream and the presence of predators. Many salmon are territorial and chase others out of their space. Higher densities are possible when the habitat is complex and food is plentiful. Space requirements generally increase and densities normally decrease as the fish grow larger. 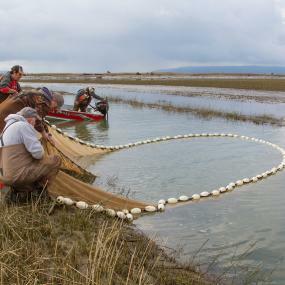 A safe estuary: Before salmon can swim out to sea, they must undergo a major metabolic shift that allows them to live in saltwater following their freshwater stage of life. This extraordinary transition is called smoltification. River deltas, formed by the deposition of upstream sediments, are key habitats that may include marshes, tidal channels and eelgrass beds where salmon can eat, grow and hide from predators as they undergo this critical transition. Human alterations of stream channels, floodplains and marine shorelines can shrink these key habitats and limit salmon survival. One measure of stream health is the type of land cover near streams, floodplains and marine shorelines, because forested lands protect nearby salmon habitat better than concrete and other impervious surfaces associated with development. A 2015 study by NOAA researchers found that development between 1986 and 2008 took up considerably less than 1 percent of the land cover located close to salmon habitat in the Puget Sound region. The general trend was a decreasing rate of development in the last years of the study. Furthermore, over time, ongoing development seemed to be shifting into areas where salmon habitat was already degraded — one of the major goals of the state’s Growth Management Act. Kurt Fresh, an author of the study, said the findings, based on satellite images, do not support claims that Puget Sound is suffering from large, ongoing losses of salmon habit. Scientists agree that salmon habitat has been severely degraded throughout Puget Sound over the past century, Fresh noted. Some streams are mere remnants of their historical condition, and none will ever be the same. Many unique salmon populations have gone extinct, including at least 16 Chinook runs, according to NOAA estimates. But in recent times, habitat losses have been greatly reduced. Habitat has actually increased on some large river deltas, Fresh said. And the satellite images used in the study were unable to make out changes that don’t alter the landscape much — including habitat-restoration projects that reconnected side channels to a river, added logjams to a stream or converted farmland into wetlands. While biologists with NOAA Fisheries are taking new measurements of habitat conditions to assess whether the overall change is positive or negative, Puget Sound tribes believe the answer is already clear. A 2016 report from 20 Western Washington tribes, titled “The State of Our Watersheds,” includes findings from the 20 watersheds that are part of the “usual and accustomed” fishing areas for each tribe. The report recognizes the benefits of many habitat-restoration projects throughout the region, but it points out that many projects remain uncompleted, that habitat losses have placed salmon in dire jeopardy and that human population growth continues to degrade the remaining habitat. Problems cited include armoring of freshwater and marine shorelines, lack of forest cover, too many roads and stream crossings, increasing impervious surfaces, lack of stream buffers on agricultural lands, overdeveloped floodplains, and excessive groundwater extraction. The tribes’ right to fish for salmon, which is guaranteed by treaty, is extraordinarily important to native people, said Dave Herrera of the Skokomish Tribe, who represents tribal interests as chairman of the Tribal Management Conference. The North of Falcon process is the name of the annual negotiations to determine tribal and nontribal fishing seasons north of Cape Falcon in Oregon. The goal is to allow salmon fishing throughout the region, with harvested salmon shared equally between the two groups. In 2016, state and tribal negotiators failed to reach agreement over the limited Chinook run, forcing a fishing closure for the first time and inflaming tempers rarely seen since the “salmon wars” of the 1970s. Most residents of the Puget Sound region seem to go about their business as if nothing were wrong, Herrera lamented, adding that the tribes would like to see spending for salmon restoration increased 50 to 100 times the current expenditures. As “The State of the Watersheds” describes, habitat continues to be lost, and restoration projects are not making up the difference, Herrera said. Babcock said NOAA’s assessment of overall changes in salmon habitat — positive and negative — should take into account information from tribal biologists, watershed experts and anyone who can provide explicit details about habitat conditions. Many groups have undertaken “impressive monitoring and evaluation activities,” she added, but the data must be validated. Ultimately, the productivity of a salmon stream depends on all parts working together, experts say. The hope for salmon recovery lies in reducing damage from new development, restoring lost habitat over time, and making sure that other activities — such as harvest, hatchery and dam operations — support an expansion of wild salmon populations. Protecting and restoring diverse habitats helps to maintain the genetic diversity of the remaining wild salmon. That diversity in salmon populations could be the key to saving the species from future man-made or natural disasters, as well as uncertain conditions brought about by climate change. In an amazing testimony to evolution, different species of salmon have become specialized to improve their chances of survival and to reduce overall competition. Strong-bodied Chinook are suited for rushing rivers. Sleek coho thrive in upstream waters, where they remain for their first year of life. Sockeye depend on lakes for their early growth, while chum and pink salmon head downstream into the brackish estuaries as soon as they can travel. Steelhead trout, unlike other Pacific salmonids, have the ability to spawn multiple times. Understanding the various salmon species is essential to designing a successful habitat-restoration project, according to George Pess, watershed program manager for NOAA’s Northwest Fisheries Science Center. For example, Chinook are highly dependent on mainstem channels and delta areas of a river, while coho tend to rely on beaver ponds and wetlands. The recovery plan for the threatened Puget Sound Chinook includes separate chapters on improving conditions in each location where Chinook can be found — mostly the larger river systems. Restoration should be targeted toward reducing factors that limit population growth through all the life stages of a salmon, Pess said. For example, adult coho may find adequate habitat to spawn in the fall, resulting in a relatively large number of fry. But the most critical time for coho is typically winter, when these unique fish seek out side channels and wetlands to avoid being swept away by high flows. Likewise, ponds and wetlands are important to coho survival during low summer streamflows. Restoring these habitats is the best way to help coho. Migrating Chinook typically include fish that come in varying ages and sizes. The smallest Chinook, called fry migrants, head out to the estuary soon after they emerge from the gravel. Larger fish, called parr migrants, remain in freshwater for a few months to gain size and strength. Still others, known as yearlings, spend a full year in freshwater. In the Skagit and other Puget Sound Chinook streams the decision to leave or stay appears to be based in part on how many young fry are trying to fit into the available habitat, according to Eric Beamer, research director for the Skagit River System Cooperative. In years when the number of fry is large and the habitat is crowded, a greater number of the tiny fish tend to move downstream, Beamer said. Some fry will seek food and shelter in the brackish water of the river delta. But if food is limited or conditions are too crowded on the delta, they may continue to the open waters of Skagit Bay. As one might expect, the survival rate for the tiny fry migrants is lower than for those fish that wait and grow larger, according to studies. The Skagit River and its delta have lost 70 percent of their rearing habitat since the 1880s, yet it still supports the largest salmon run in Puget Sound, including six diverse populations of Chinook. The life histories of the six Chinook populations are quite complicated, Beamer said. Still, one way to increase the overall Chinook population is to protect and restore freshwater rearing habitat for fry while also making the delta more hospitable. Those restoration strategies are part of the Chinook Recovery Plan for the Skagit, and they are being carried out on a large scale. “In the Skagit Watershed, we’ve made measurable progress towards our habitat goals with voluntary restoration projects under the current regulatory standards — even when compared to habitat that has been lost or modified through development,” said Richard Brocksmith, executive director of the Skagit Watershed Council. Preliminary results of a recent analysis showed that 1,094 acres of trees were planted along 96 miles of streams within the Skagit watershed between 1999 and 2015. Another recent study by Fish and Wildlife showed that 139 acres of forest cover was lost between 2006 and 2013. In the estuary, between 2004 and 2013, habitat projects restored 339 acres of rearing habitat, while 1 acre was lost to landfilling and 43 acres were lost to sea-level rise and sedimentation caused by river levees. What remains to be seen, Brocksmith said, is whether restoration efforts are being overridden by other human changes, such as habitat alterations, water usage, climate change and invasive species. If the positive changes can be maintained and the negative changes reduced, experts are confident that the number of young chinook migrating to the ocean will increase — and those numbers will be reflected in considerably higher counts at the fish trap on the Skagit River. Every river system has its own unique characteristics, and the goal of restoration should be to find those factors that are limiting population growth in each location, according to George Pess, watershed program manager for NOAA’s Northwest Fisheries Science Center. The Nooksack River, north of Bellingham, appears to have an entirely different habitat problem from the Skagit. Instead of having many Chinook fry and not enough rearing habitat, the Nooksack has been having trouble with salmon survival during the egg-to-fry stage. One answer may be to improve incubation habitat by reducing the amount of sediment and pollution coming into the river while controlling peak streamflows. Another idea mentioned in the Nooksack plan is to boost egg-to-fry survival of wild Chinook with a temporary hatchery program. Identifying population bottlenecks — where high mortality is taking place — will help direct investment for restoration projects, said Pess. If fixing one bottleneck increases the number of young salmon that survive, another limiting factor might need attention. It may seem like a never-ending effort, but progress is being made to restore stretches of degraded stream channels, floodplains, shorelines and estuaries to a condition that works for salmon. Considering the needs of salmon, freshwater habitat in the Puget Sound region has been vastly diminished — some areas more than others — as increasing settlement continues into its second century. Studies of salmon productivity have confirmed that improving habitat the right way can boost salmon populations if other things remain equal. In fact, some studies suggest that habitat-restoration projects are often a better financial investment than building and operating salmon hatcheries. Hanging in the balance is the need for developers to protect natural habitat while finding places for people to live and work. Land-use regulations have been adopted and are being refined to safeguard salmon streams, wetlands, floodplains, estuaries and shorelines, as well as upland habitats for wildlife. Although most of the regulations have been based on scientific studies, few have been thoroughly tested for their ability to protect salmon habitat. Also of concern is whether state and local governments are ensuring that developers carry out the mandated safeguards and those protections remain in place over time. Many local governments say they don’t have the staff to fully enforce environmental regulations. If local governments could ensure that environmental rules on the books are permanently carried out across the watersheds, the degradation could be greatly reduced, experts say. For example, one of the major concerns with development are all the roads, driveways, lawns and rooftops that increase the flow of stormwater well above what was seen when the land was in forest. At the direction of the Washington Department of Ecology, counties and cities have adopted new stormwater rules designed to mimic pre-development conditions. Where practicable, the new rules require that stormwater be allowed to infiltrate into the ground, using rain gardens, man-made ponds and pervious pavement — a process known as low-impact development. The new stormwater rules, required under the federal Clean Water Act, should reduce damaging high flows going into salmon streams from new developments, said Chris May, director of Kitsap County’s Surface and Stormwater Management Program. Studies are underway to see how well the new rules protect salmon. In many areas, bigger problems are found in existing neighborhoods and business districts built without stormwater controls, he said. In Kitsap and other counties, local governments are upgrading stormwater systems so that more water goes into the ground and less goes directly into the streams. In one of the original studies that evaluated stormwater impacts on Puget Sound streams, May estimated in 1997 that serious impairment to salmon habitat begins when impervious surfaces cover 10 percent of the land in the drainage area. Perhaps, he said, instead of serious problems appearing when a watershed reaches 10 to 20 percent impervious surfaces, the new stormwater controls might allow 25 or 30 percent before problems begin. Meanwhile, forest practices regulations — along with habitat conservation plans adopted by the state and major timber companies — require loggers to leave trees alone within buffers alongside streams. Large buffers are afforded to streams that contain salmon. The rules are to be updated when research reveals that new approaches are needed to protect habitat for salmon, as required under an agreement between the state and federal governments, environmental groups and timberland owners. Forest roads, ditches and culverts also must be upgraded to protect surface waters and allow salmon passage. It is “passive,” Price noted, because outdated forest practices allowed trees to be cut to the edge of many streams. In those areas, it will simply take time for streamside trees and vegetation to provide the full benefits of shade and structure. While the NOAA study focused on land uses near to streams, other studies have taken a wider landscape approach, including the Vital Signs indicators adopted by the Puget Sound Partnership. The goal for addressing development is to reduce conversion from forestland in areas deemed to be ecologically important. The actual “target” is to convert no more than 0.15 percent of those ecologically important lands in any five-year period. The goal remains elusive, since the rate was 0.36 percent — more than twice the target rate — for the period 2006 to 2011. NOAA’s study, which is focused on threats to salmon, is expected to show whether humans are making better choices today than they have at any time in history and whether that is enough to restore Chinook populations in Puget Sound. Growth Management Act (1990): One of the primary goals of the GMA is to reduce sprawl into rural areas where natural systems are relatively intact by concentrating future growth into existing urban areas. Local governments were given authority to decide how to carry out the goals of the act through comprehensive plans and associated development regulations. As a result, land-use rules vary significantly from county to county. Critical Areas Ordinances: The Growth Management Act requires the protection of all Critical Areas, such as wetlands, aquifer-recharge areas, fish and wildlife habitat, floodplains and unstable slopes. Protection means “no net loss” of structure, value or function of natural systems. Special consideration must be given to the preservation and enhancement of salmon. Such protections, developed through the use of “best available science,” are incorporated into ordinances. Mitigation is allowed to offset damage to natural systems when protection is not possible. Shoreline Management Act (1971): The protection of shorelines adjacent to marine waters, lakes and major streams is the goal of the Shoreline Management Act. The law also applies to associated wetlands and floodplains. Regulations are incorporated into Shoreline Master Programs, approved by local governments and endorsed by the Washington Department of Ecology. The law establishes priority uses for all lands within 200 feet of the shorelines and requires that approved development be carried out with “no net loss” of natural functions. Hydraulic Project Approval (1943): Washington Department of Fish and Wildlife enforces state requirements to protect fish and shellfish habitat when a project proposes to “use, divert, obstruct or change the natural flow or bed” of fresh or marine waters. Projects subject to review include bulkheads along shorelines in both saltwater and freshwater. Permits may limit the extent or timing of a project to reduce impacts to fish and wildlife. Water laws: Washington’s ever-changing water laws include specific provisions to ensure that surface and groundwater withdrawals do not significantly affect aquatic resources, including fish. They include the Washington Water Code of 2017, which sets out procedures for protecting and adjudicating water rights; the Ground Water Code of 1945, which establishes legal connections between surface and groundwater; the 1969 Minimum Water Flows Act, which sets out procedures for protecting streamflows; and the Water Resources Act of 1971, which gives the Washington Department of Ecology authority to establish and protect streamflows for fish and wildlife as well as other values. Stormwater permits: State and local governments, industrial facilities and commercial businesses that discharge stormwater or wastewater through pipes must obtain a National Pollutant Discharge Elimination System (NPDES) permit under the Clean Water Act. Municipal stormwater permits regulate street runoff flowing into storm sewers as well as runoff from new developments. Recent updates require that new systems be designed to mimic the flow rate of natural runoff. The goal is to reduce extreme high and low streamflows, which can disrupt all life stages of salmon, and to protect water quality. Rain gardens and other methods of infiltrating stormwater into the ground (low-impact development) are required where soils allow. Forest Practices Regulations: Rules administered by the Washington Department of Natural Resources include requirements designed to preserve streamside trees to maintain shade for cooler water, to reduce sedimentation and to enhance woody debris that forms salmon habitat. The rules are based on an agreement between forest landowners, environmentalists, and various government agencies. The agreement requires ongoing scientific studies and adaptive management to protect aquatic habitat for multiple species. Other rules require landowners to develop Road Management and Abandonment Plans (RMAP) to control runoff into streams and to upgrade culverts to ensure fish passage.